The Cabin at Upper Peninsula Lakeside Cabins is perfect for family or couples! Re-modeled in 2013, this Michigan lakefront cabin has a complete kitchen, dining, and living area next to a very private lake. You just found a stress-free rural area to relax with family and friends on pristine, private Upper Holmes Lake! This Cabin has amazing lake views inside and out - Plenty of cabin windows with a sliding glass door that leads to the patio. If your group needs more room, we also have a Lodge you can rent that’s 1/4 mile away. Sleeping arrangement: Large private bedroom has a new double bed. Bedroom has 1 (new) double bed, a big closet. At the Cabin is 2000 feet of Lake Frontage. 100 Wooded Acres! You might not see another person the entire week. You can hike the trails & scenic vistas on your private acreage (look out over the Paint River valley see see Crystal Falls, MI 5 miles away!) Also, listen for the TRAIN WHISTLE, then paddle to the north end of the lake and watch the train cross part of the lake. Our unique city of Crystal Falls has clean air and water within scenic surroundings. Crystal Theatre and Good Times Contemporary Center are cultural and historic preservation trademarks. Harbour House Museum is a unique find too. 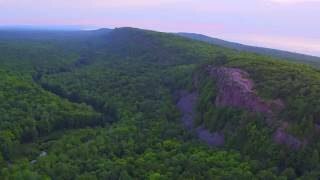 Our central Upper Peninsula location means an easy day drive to the Porcupine Mountains and Lake Superior. The Upper Peninsula of Michigan offers visitors year round activities: Fishing, hiking, swimming, hunting and Color Tours, Skiing and Snowmobiling. Fill your days with UP outdoor adventures and return to a private cabin where you can relax on the deck that has a picnic table and new gas grill. Pack some fishing tackle and spend the day right here at the lake! Good pan fishing with an occasional bass, pike or walleye make for a great fish fry at the fire pit in the yard (firewood is supplied). It’s not cabin time without S’mores, snacks and lake relaxation. 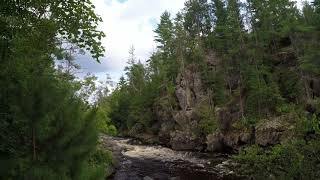 Since you book with us (David and Nancy your hosts), we can give you lots of ways on how your group can live like a Yooper: Like to hike? The River Walk is for you: Fresh air, clear streams, the Paint River, interpretive nature trail - it’s a popular spot for scenic outdoor weddings. Like to trout fish? Find your spot along 868 miles of Blue Ribbon Trout Streams around picturesque downtown Crystal Falls / Iron County. Golf like a local at the Crystal View Golf Course, 9 challenging holes on the banks of the beautiful Paint River. Cabin is $1100 per week 7 nights. 7 night minimum. We are your hosts David and Nancy Young. U.P. of Lakeside Secluded Cabins. We purchased The Cabin in 2010 and The Lodge in 2014. We live nearby and can quickly assist renters if needed.